Reading this book was like eating chocolate chip cookies freshly baked but short changed on the chips and salt. Everything in here was good, but there was enough missing to leave me dissatisfied. It's not as if Michael A. G. Haykin has any shortcomings in his academic training. He shares his personal experience of "Walking with the church fathers" at the end of the book, though I wish it was at the beginning. The Toronto School of Theology had a diverse faculty of experts from Lithuanian Hebrew Christians to Jesuit scholars. All of whom encouraged him to continue his study in original languages and patristic studies. I need to insert some of my story here to clarify what expectations to this book. I'm a low church evangelical who is loves church history and is beginning to engage the primary writings, though not in Greek or Latin, and more of the academic literature, including recently finishing Pelikan's 1st volume in the development of Christian doctrine, The Emergence of the Catholic Tradition (100-600). In fact, as Lent began this year, I finished Pelikan's book and started a daily Lenten reading plan of patristics. So I had recently read The Letter to Diognetus before coming to Haykin's discussion of it in this book. All this to say, I am a true sophomore (wise dummy) reading Haykin's book, knowing enough to not trust everything he writes, but not enough to avoid looking dumb when expressing those doubts. 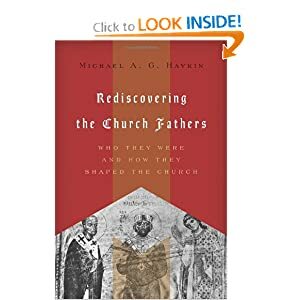 If you are a Protestant with no exposure to the fathers of the church, then stop reading this review and get this book. You don't want to be this guy in Haykin's anecdote. He points to Wesleyan's "inclusion of a number of Patristic spiritual classics: some of the writings of the apostolic fathers, the acts of early Christian martyrs, and the spiritually rich sermons of Macarius Symeon" (p. 28) in his fifty volume collection, in 1750. The selection of fathers is haphazard, Ignatius, Origen, Cyprian, Ambrose, Basil, Patrick, and Mathetes, the letter writer to Diognetus. It turns out that the book is a collection of chapters and papers Haykin has written for other occasions over the past 20 years. Certainly there are tasty chocolate chips in every chapter, and I'll share a few more, but the lack of unified intention to this book is like the lack of salt in the cookie recipe. I appreciated the demonstration from Ignatius's letters, some of which I read this month, his assertion of the deity of Christ at the turn of the 1st century, which some critics of historic catholic orthodox Christianity need to learn about our history. From his letter to the Ephesian church, chapter 7. The chapter on Origen was helpful for me. He was condemned a heretic, yet he was appreciated for so much of the other things he wrote. I learned how he was appreciated by the fathers and how to appreciate him, and those similar in these times from this helpful paragraph following a quote of his teaching an unorthodox understanding of the trinity. It is passages like the one above regarding the "subordination" of the Son and the Spirit, as well as Origen's speculations about the possible salvation of the Devil and that created souls have an eternal existence before embodiment, that led some at the close of the Patristic era to write him off as having gone beyond the bounds of Christian orthodoxy. In this regard, it needs to be remembered that a paragon of orthodoxy like Basil of Caesarea thought Origen's works worth reading closely for theological and spiritual gems - he and his close friend Gregory of Nazianzus edited an anthology of such passages, the Philocalia (358 -359) - even though he knew that Origen's ideas about the Spirit were not always sound. The words of Robert Murray M'Cheyne (18130-1843) after hearing of the death of Edward Irving (1792-1834) - the preaching wonder of the 1820's, though a man who argued that the Son of God assumed sinful humanity - seem apropos of Origen: he was "a holy man in spite of all his delusions and errors." p. 75-76. I learned more on the perception of the Eucharist in the early church in the chapter on Cyprian. It's different than mine. It seemed to me that Haykin liked to find points of contact between today's "Young and Reformed" but also point to boundary markers. Early on he likens a portion of the apologetic Letter to Diognetus to sounding like something "lifted stright from the pages of Luther." p. 19 On the other hand, he quotes a voice, Forsyth, accusing Cyprian of changing the eucharist from a sacrifice of praise by the church to a propitiatory sacrifice by the priest, then says whether Forsyth is right or not "in this regard is moot," p.98. Immediately, I wrote in the margin, "so did Tertullian." Haykin did, also, in a foot note and added Origen. It sounded to me like a cheap shot against non-Protestant understanding of the Eucharist. Cyprian wrote in the latter 200's but Tertullian was writing fifty years before him. For an introduction to the Fathers, mentioning a poorly supported accusation like Forsyth's and leaving powerful counter examples to a footnote is disappointing because it is uncharitable to our Catholic and Eastern Orthodox family members. The chapter on Basil was excellent, because I know so little about him. His story is complex and full of the ups and downs of every man's life, even if he is one of the doctors of the church. I found the appendix on Pelikan's, The Emergence of the Catholic Tradition, very interesting, having just finished it myself. Haykin writes, in regards to the accusation of the church being Hellenized to the point of losing it's distinction from the culture, "Personally, I would find myself in broad agreement with Pelikan's answer to what has been a major approach of numerous late nineteenth-century and twentieth-century students of Patristic thought." p. 161 But it's the footnote to this sentence that resonated with me. I've written a few times about the deficiency of open theism, search for it on the blog, but to see it framed in terms of its lack of historical consistency, is encouraging as well. Haykin goes on to complain about the "number of noticeable lacunas" in Pelikan's massive work. This is the same complaint I have of Haykin's book. Of course, the present book is only 165 pages and Pelikan's is more than twice as long. I'm sure Haykin appreciates Pelikan's struggle in making editorial choices. I wish Haykin had spent time on Tertullian or Athanasius, but I am glad to be introduced to Basil. Haykin's book should whet the appetite of the believer who knows nothing of his spiritual ancestry, and in that regard, this book is a success. But it would benefit from a better coherence, an essential ingredient in a tasty dessert of a book. Chocolate chip cookies always taste good, but they are even better with salt and extra chips. This dessert was a complimentary review copy from Crossway.